"Set features a refrigerator, freezer, oven, microwave, and washer." "Customers say kids love it, and it’s a great kitchen for the price." "It features fun, realistic sound effects." "Comes with 25 accessories, including plates, cutlery, and condiments." "Features three appliances, including a stove, sink, and refrigerator." "Customers love the classic wood look and quality construction." "This backyard barbecue set is sturdy enough for indoors or outdoors." "Older kids who want a more realistic look will love this set." If you've been searching for the perfect play kitchen for your children, look no further than the KidKraft Ultimate Corner Play Kitchen with Lights & Sounds. As far as price, features, and design go, this interactive kitchen is hard to beat. "It's so realistic. I tried several kitchens before this and this was the best," wrote one customer. "My kids play with it for hours." The set features a refrigerator, freezer, oven, microwave, and washer. All the doors open and close, and lights and sounds help bring all their culinary adventures to life. The counters have a granite-like look for a sleek, modern feel, and there’s plenty of counter space to prepare meals. It’s also great if you’re tight on space, as it measures 42 x 32 x 36 inches and the L shape can fit into a corner. It does require nine batteries, but parents say the realistic sounds from the ice maker and other appliances make it worth stocking up on them. Recommended for ages 3 and up, parents report that it’s well made, and they love how realistic the lights and sounds make the experience. Kids will love this award-winning kitchen set, which reviewers rave is well-built, easy to assemble, and large enough for several children. The quality and versatility of the KidKraft Uptown Espresso Kitchen make it another solid choice, and the price is right, too! It features a variety of realistic appliances, including a microwave, refrigerator, oven, stove, and sink. The doors on the appliances open and close and many of the knobs turn and click as well. There’s also a phone and working chalkboard where kids can write the day’s menu or notes for the chef. Reviewers love that this play kitchen has a realistic design without any crazy colors or cheap plastic pieces (it's made of wood composite). Many say it's quick to assemble and that their children play with it for hours. Overall, most agree that it is a great purchase for young chefs and kids who love to play pretend. For a sturdy little kitchen set with a lot of options for cooking up fun, there’s this Cozy Kitchen from Step2. It’s compact (11 x 20 x 38 inches), so it’s great for small spaces, but it provides everything they need to cook up feasts aplenty, including a refrigerator and sink. It also comes with a 21-piece accessory set that includes plates, pots and pans, salt and pepper shakers and a coffee pot. Designed for kids ages 2 and up, it’s made of plastic, so it’s sturdy and easy to clean. It’s simple to set up too, which is a bonus for parents. Customers say kids love it, and that’s it’s a great kitchen, especially for the price. They say it’s the perfect size for smaller children, and they like that it doesn’t take up too much room. It’s light too, which makes it great for moving into the kitchen while mom and dad cook, so kids can cook right alongside them. For little chefs, this kitchen set from Little Tikes is just right. It’s interactive and features fun, realistic sound effects, like the sound of chopping food, eggs sizzling or water running to keep them engaged. There’s also an app that allows them to play interactive learning games as they cook, using a Bluetooth-enabled device. It also comes with 46 accessories, including food, utensils, and cookware for a complete culinary package. Parents say kids love the abundance of accessories that come with this set and the realistic details are impressive. Some report there are kinks with the interactive app and that it doesn’t work with older model tablets, but most say that overall, it’s a great, interactive kitchen set that’s perfect for toddlers. The Step2 LifeStyle Custom Kitchen is also a great option for your toddler, and it's a bit more affordable, which parents are sure to love. This set is ideal for ages 2 to 6, and it has a host of cool features like faux appliances and sound effects. 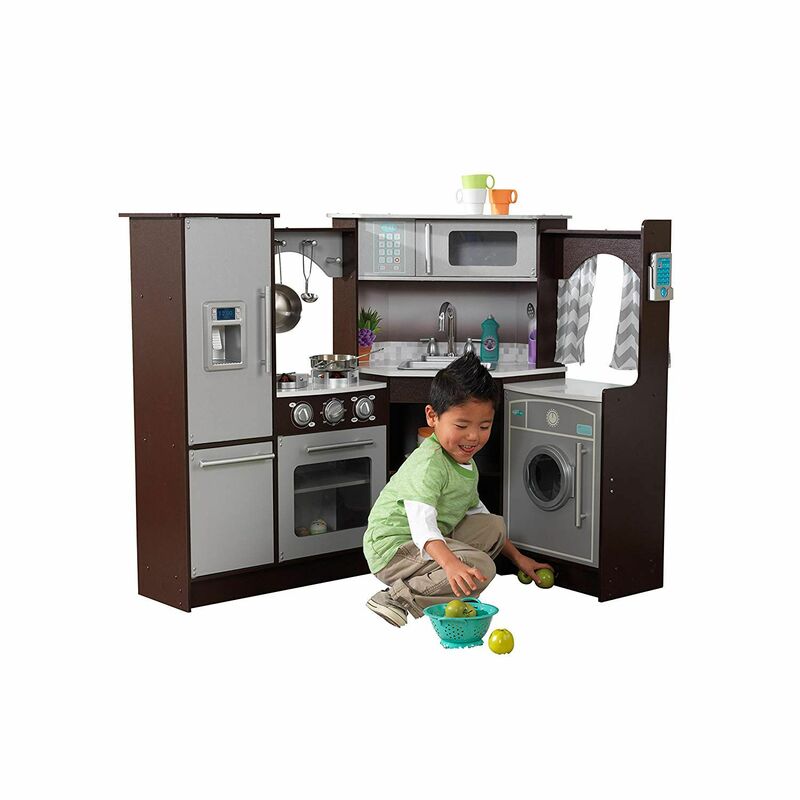 Your toddlers will love playing house with the realistic oven, microwave, and refrigerator. When they put the special frying pan or boiling pot on the stove, they'll hear the sound of food cooking! This play kitchen even includes a recycle bin and pull-out drawer where kids can store play food. In addition to the kitchen itself, this product comes with a 20-piece accessory set with items like pots, pans, plates, and cups. Parents say their young children genuinely enjoy playing with the Step2 Lifestyle Custom Kitchen Playset, and many note that it’s a high-quality toy. This product sets itself apart from comparable play kitchens thanks to the cool sound effects and included accessories. The only downside reviewers noted is that you need a power drill to assemble it. Most kitchen sets come with all the appliances kids need to get cooking, but the extras they need to serve up the grub are sold separately. That’s not the case with this kitchen set from Step2, as it comes with 25 accessories, including plates, cutlery, condiments, and even a recycling bin to start promoting those eco-friendly habits from a young age. Recommended for ages 2-5, it’s the perfect size for toddlers (11 x 34 x 38 inches), and its plastic parts are toddler tough too. It features an oven, a sink and a cooktop, complete with fun lights and cooking sounds. There’s ample counter space for all their preparation too. Parents say this kitchen is cute and compact, and they love the simple, gender-neutral look. Most say assembly is relatively easy, and that it’s a great little kitchen that kids play with for hours on end. For classy, well-made furniture and accessories, Pottery Barn is a go-to for many adults, and this kitchen set from Pottery Barn Kids imitates that same stylish vibe for kids. This set features three appliances, including a stove, sink, and refrigerator. The details are meticulous, and the sink (a farmhouse sink, of course) is even equipped to hold water, so kids can scrub their pots and pans for real. It’s made of solid wood and fiberboard, with brass-colored fixtures. It comes in either grey or white, and it measures 36 x 12 x 33 inches. It’s great for getting a lot of active play opportunities into a relatively small space. It’s recommended for ages 3 and up and is sure to be a hot spot in any playroom. Bon appetit! For the classic look of wood, parents love this kitchen set from Melissa & Doug. It features a sink, refrigerator, stove and cooktop, all in bright primary colors. Realistic touches include a working timer, a cutting board, knobs that click and a swiveling faucet. The removable sink makes for easy washing. Designed for ages 3 and up, it measures 26 x 36 x 16 inches. All the tools and hardware needed for assembly are included, and parents say the instructions are clear and easy to follow. They note that the size is great, particularly for smaller kids, the quality is solid, and kids love playing with it. What’s not to love about cooking in the great outdoors? This backyard barbecue set from Little Tikes lets little ones get their grilling on, no matter the weather. It features a two-tiered gas grill, complete with a starter button and knobs that click. There are burners on the side for cooking up the extras and storage underneath. It also comes with all the BBQ necessities, including a hamburger, hot dog, ketchup and grilling accessories. Made of plastic, this set is sturdy enough to keep indoors or outside, and it’s light enough (just under 10 pounds) to move it between the two. It measures 24 x 11 x 28 inches and is recommended for kids ages 2-4. Parents say it’s a great alternative to a traditional kitchen set and kids love to flip the burgers on their backyard barbecue. Kids who want a more realistic look in their kitchen set will love this gourmet set from Naomi Home. The look is sleek and modern with features that resemble fancy subway-tile backsplash, granite countertops and stainless steel appliances. It includes a four-burner stove, an oven, dishwasher, refrigerator, microwave, and sink—everything they need to cook up a storm in serious style. Extra cute details include an ice/water dispenser graphic on the refrigerator, a chalkboard on the freezer for notes and a dish towel bar. Recommended for kids ages 3-10, this wooden set, which measures 41 x 40 x 16 inches, will serve up years of pretend-play inspiration. Customers say that while assembly can take a bit of time, once it’s together, it’s a sturdy, well-built kitchen set that kids love. Our writers spent 6 hours researching the most popular kitchen sets on the market. Before making their final recommendations, they considered 30 different kitchen sets overall, screened options from 20 different brands and manufacturers and read over 150 user reviews (both positive and negative). All of this research adds up to recommendations you can trust.